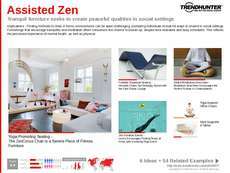 Find Better Ideas, Faster ® with a custom meditation trend report, our PRO Dashboard and 80+ categories of premium trend reports. 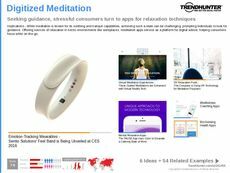 Probing the emerging programs, classes, apps and devices related to meditation and yoga, the Meditation Trend Report examines the changing scope of relaxation tools and techniques. Exploring the increase in people's interests in mental health and mindfulness, the report finds the modern meditation methods that are attracting attention, such as meditation apps that can provide a break from a hectic work environment. Health brand managers and retail store operators, yoga studio owners, gym and fitness instructors will all benefit from the crowd-sourced information found in this report about patterns in the rising interest in meditation. The information is also of value to professionals working for rehabilitation centers, hospitals, schools and therapy centers. 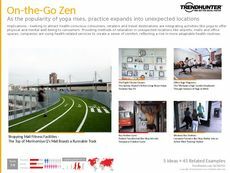 The Meditation Trend Report compiles information about yoga studios, classes and meditation apps that are growing in popularity with a health-conscious market.